Liquid Chromatographic Analysis of Food and Beverages, Volume 1 contains the proceedings of a Symposium on the Analysis of Foods and Beverages by HPLC, organized by the Flavor Subdivision of American Chemical Society and held in Honolulu, Hawaii, on April 1-6, 1979. The papers explore the applications of high-performance liquid chromatography (HPLC) to food and beverage analysis. Emphasis is on advances in technology and instrumentation as well as analytical results in a variety of contexts. This volume is comprised of 13 chapters and begins with a discussion on the use of spectroscopy in liquid chromatographic analysis of foods, with particular reference to the techniques and instrumentation required to obtain reliable qualitative data on components isolated via HPLC. The reader is then introduced to HPLC determination of naturally occurring capsaicins; Fast separation of amino acids using ion exchange chromatography; reversed phase HPLC for analyzing aflatoxins in foods and beverages via fluorescence detection; and the use of dual detectors for HPLC multivitamin analysis of citrus juices. High performance radial chromatography of aflatoxins and HPLC analysis of monosaccharides in avocado are also explored. 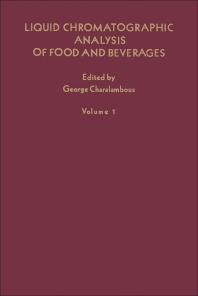 This book will be of interest to students, chemists, food technologists, and those in the food and beverage industry.